Friday April 6th 1973: The Mets opened up 1973 just four years off their Amazing Championship 1969 season. The pitching staff was their strength & along with some new faces there was optimism. The Mets had traded away fireball pitcher Nolan Ryan who would go on to Hall of Fame success in California with the Angels. The Mets received Jim Fregosi who they thought was their new slugging third baseman. It didn't turn out that way, as Fregosi was gone by summer. Opening Day 1973 brought a crowd of 27, 326 to Shea Stadium, on a Friday afternoon April 6th to see the Mets host the Philadelphia Phillies. In the bottom of the 4th inning, Felix Millan led off with a double but the next two batters were retired. Cleon Jones then hit a HR over the left field fence to put New York up 2-0. In the bottom of the 7th inning, Jones connected off Carlton for his second HR of the day, giving the Mets all they would need for the 3-0 victory. 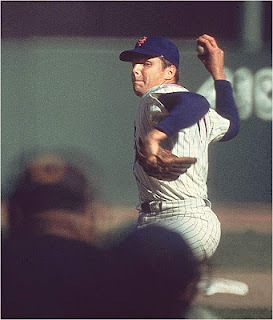 Tom Seaver cruised along allowing just four hits into the top of the 8th inning, striking out eight batters along the way, walking just two. In the 8th he allowed a pinch hit double to Bill Robinson & then a walk to Del Unser. Manager Yogi Berra went to the bullpen, calling on Tug McGraw. McGraw got pinch hitter Deron Johnson to fly out & then retired the Phillies in order in the 9th, to complete the shut out while earning his first save of the year. The Mets only had five hits themselves that day, with Cleon Jones gathering up three of them. Felix Millan & Jim Fregosi got the other two hits. In contrast to today's long drawn out games, the 1973 opening day contest only took one hour & fifty six minutes to play. 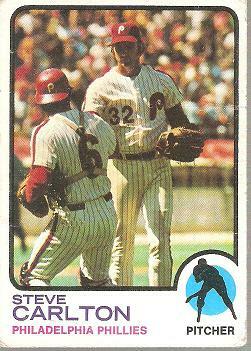 1973 Phillies notes: Steve Carlton was coming off an incredible 1972 season in his first year in Philadelphia. He had just been traded there from the St. Louis Cardinals that season, for pitcher Rick Wise. "Lefty" won the '72 Cy Young Award & the Pitching Triple Crown; going 27-10 with 310 strike outs & a 1.92 ERA. That season the Phillies were dreadful, winning just 59 games under managers Frank Lucchesi & Paul Owens. Carlton accounted for almost half the teams wins. They would finish last again in 1973 (71-91) but things began to turn around; as this was the rookie seasons for future Hall of Famer Mike Schmidt & catcher Bob Boone. Future 1986 batting coach Bill Robinson would hit 25 HRs (second to Greg Luzinski) & drive in 65 runs (tied for second behind "the Bull" Luzinski, with future Met Willie Montanez). Centerfielder Del Unser who would play for the 1975 / 1976 Mets would lead the team in batting (.288).